Charles Boyer and Bette Davis in All This and Heaven, Too (1940). Picture from TCM. If Edith Wharton was so enthusiastic about writing the Lizzie Borden story, why didn’t she finish the play Kate Spain? But Wharton also worried that “it was more than likely that it had already been used.” Her friend Edward Sheldon, the playwright, told her that it had been done, she claimed, and so she decided not to finish the play. The story “Confession” was another matter; as she told Minnie Jones, “I do not think the story will suffer much from its Borden origin, as you will have seen by this time that it is of no importance in my fable, and my young woman could quite as well have murdered an intolerable husband” (Letters 584). In “Confession,” the narrator wonders whether Kate could be “the murderess of her own father” (Lewis, Collected Stories 2: 817), but the other details differ from the case. Lizzie Borden listens to testimony about the burning of the dress. From trial accounts of the time in The Lizzie Borden Sourcebook (at the link). This helps to explain one mystery: why is Kate Spain so much more explicit about the murder than “Confession”? If Wharton intended the story to be a more general “fable” rather than a treatment exclusively of the Borden story, the ambiguity makes sense. Kate Spain has many specific details, including a piece of stained calico burned around the edges and a deleted segment stating that the father had been killed while lying on the sofa. These references show Wharton’s familiarity with the case. If you’ve read any of the books about the case, for example, you’ll recall that Borden is supposed to have burned a calico dress in the stove. “I am going to burn this old thing up; it is covered with paint,” she said, which apparently didn’t influence the jury’s decision. Sheldon didn’t stop at telling Wharton that the Borden case had been overdone, however; he suggested instead that she use “the Praslin murder instead.” The “Praslin murder” was a famous murder case involving the Duc de Choiseul-Praslin, whose wife, Fanny Sebastiani (by whom he had 10 children), was apparently passionately jealous of him and had recently fired the family’s governess, Henriette Deluzy-Desportes, due to her suspicions. On 18 August 1847, the Duchesse was found bludgeoned and stabbed to death; the Duc maintained his innocence but, while awaiting trial, committed suicide. The governess, Henriette Deluzy-Desportes, was briefly jailed in the murder but released. She became the wife of the minister Henry Martyn Field, brother of Cyrus Field (whose company laid the first Atlantic cable), and the couple later lived in Stockbridge, Massachusetts. In her letter to Minnie Jones, Wharton adds, tantalizingly, that she “began a novel on the Praslin case two or three years ago, which alas I did not finish; and last year I saw that some one else had used the subject, though probably quite differently, as I had intended the story to begin only after the governess arrives in Stockbridge” (Letters 584). In addition to being the setting for the real story, Stockbridge was a natural choice for Wharton: she had lived near there in Lenox at The Mount for ten years, and she had set Ethan Frome and Summer in the same region. The editors of the letters, R.W.B. Lewis and Nancy Lewis, don’t give a title for this unfinished Praslin novel by Wharton. They do, however, supply a name of the presumed other novel on the subject, implying that they thought this was the treatment to which she referred: Rachel Field’s All This and Heaven, Too, which was made into a movie starring Bette Davis and Charles Boyer in 1940. Rachel Field was the great-niece of Henriette Deluzy-Desportes, the governess at the center of the case. I’ve read the novel (the source of the brief summary of the murder case above), and it is sympathetic–very–to her great-aunt’s position. Here’s another mystery, though: All This and Heaven, Too was published in 1938, the year after Wharton’s death. Was this the version that Wharton referred to, and if so, how had she seen it by 1934, the “last year” when she mentioned seeing something else about the subject? If it was in French, she might have read it but wouldn’t have been deterred from writing about it, because she was looking at the American market for her works. I’ll have to look more closely to see if there’s a serial version (haven’t found one yet), but another possibility is that someone at Macmillan, which was Wharton’s publisher and also Field’s, tipped her off about it. That’s all for now, but the search continues for a lead on the Praslin novel that Wharton saw. An older Edith Wharton, writing–could it be about Lizzie Borden? Wharton obviously felt a connection to writing about the Lizzie Borden case. Wharton called the play “Kate Spain,” and it was never completed or published during her lifetime. It exists in the archives of the Beinecke Library’s YCAL MSS 42 Edith Wharton Collection, Box 20. For those who can’t travel to New Haven, it fortunately also appears in a more accessible spot, Laura Rattray’s valuable collection Unpublished Writings of Edith Wharton, Vol. 1: Plays (London: Pickering and Chatto, 2009), pp. 137-158. You can find a copy in a library near you in WorldCat by putting in your zip code at the link. The play version takes place partly in “Cayuga (or some big town in the north part of the state of N.Y.)”–upstate, in other words. Wharton had no use for upstate New York; in “The Other Two,” Alice Varick Waythorn is “unearthed” from “somewhere . . . Pittsburg or Utica” (Lewis, Collected Stories 1: 381). Wharton, or her character Waythorn, obviously had only the haziest conception of upstate New York, a common affliction, and if she meant “Pittsburgh,” even less of a conception of western Pennsylvania. Lizzie Borden. See Wharton’s description of “Kate Spain” at left. Both versions feature a Lizzie Borden-type character and a menacing female companion; both have a mystery at the center. One features overt blackmail. Again, no spoilers, but in the story “Confession,” you never learn what happened. In the play version, you learn whether Lizzie Borden “took an axe” or not. The character “Cassie” (though not necessarily her appearance or actions) is based on the Bordens’ housekeeper, Bridget Sullivan, whom the Bordens apparently called “Maggie.” She lived until 1948 (picture at the link). Her trial testimony is here. Why didn’t Wharton finish the play? Lizzie Borden, via Wikimedia Commons. Did she indeed “take an axe” and, well, you know? But to answer the question that brought you here: why, yes, she did. In fact, Wharton wrote at least two pieces about the Lizzie Borden case. For those of you who haven’t heard of Lizzie Borden, here’s the Wikipedia version. Shorter version: On the hot morning of August 4, 1892, Andrew, Lizzie’s father, and her stepmother, Abby, were murdered with an axe inside their home, which was locked from the inside. Lizzie was tried for and acquitted of the crime; after her acquittal, the murders remained unsolved. Lizzie Borden died in 1927. Edith Wharton was fascinated by the case, and she fictionalized it twice. “Confession” was first published in Storyteller 58 (March 1936): 64-85 (under title “Unconfessed Crime”) and then in The World Over, 1936. The story involves a mysterious “Mrs. Ingram” and her companion “Miss Wilpert” in Europe, but no spoilers here–you’ll have to read the story. 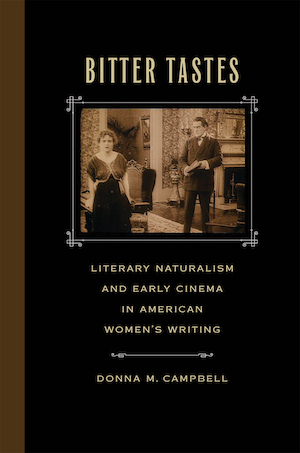 My book Bitter Tastes: Literary Naturalism and Early Cinema in American Women’s Writing is now available from the University of Georgia Press. You’ve already seen the list of women writers it covers, so here’s the Table of Contents. A few links that let you see the New York of Lily Bart in Edith Wharton’s The House of Mirth, with a few additional links just because they’re interesting. I’ll keep adding to this post as I find more. Several of the individual films are available on DVD from such collections as Treasures from the American Film Archives. The “Visual Tour” has an extended sequence of a man with a snow shovel, possibly looking for work in a way reminiscent of what Hurstwood saw in Dreiser’s Sister Carrie.